What Makes Girls Sick and Tired!!! - Bookish thoughts!!! What Makes Girls Sick and Tired!!! 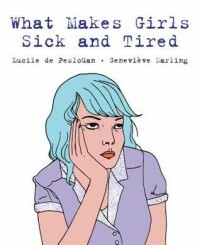 Summary: What Makes Girls Sick and Tired is a feminist manifesto that denounces the discrimination against and unfairness felt by women from childhood to adulthood. The graphic novel, illustrated in a strikingly minimalist style with images of girls with varied body types and personalities, invites teenagers to question the sexism that surrounds us, in ways that are obvious and hidden, simple and complex. The book's beginnings as a fanzine shine through in its honesty and directness, confronting the inequalities faced by young women, everyday. And it ends with a line of hope, that with solidarity, girls will hurt less, as they hold each other up with support and encouragement. My review: I feel like this was just scratching the surface. I loved it. I truly did. I loved the way the words came together with the illustrations. But in the end it wasn't anything new. It is still important, don't get me wrong. There are so many things wrong with the world when it comes to how women are treated. And it's super important to talk about it, to not just start this conversation but to keep it going. I loved it for what it is. I just wish they would have gone a bit more deeper. But there is always the opportunity to make a second part, cause let's be real, this can be a never ending series of books.